I kinda really didn’t like knitting this project. I especially hated the beginning. 368 Cast on Stitches, joined to work in the round. Thanks to my sister for holing on to my cast on, so that I didn’t get it twisted when joining (many people in the KAL had this problem). Anyway, I got a lot of compliments on the yarn the colors are deep blues and greens (my signature). 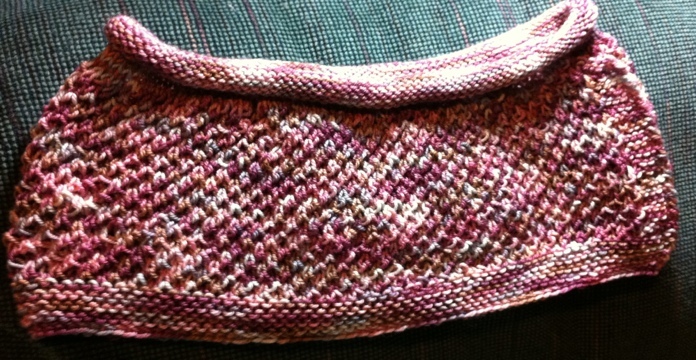 However, let me just gripe about thsi yarn for a minute…. upon winding it, there were 2 cuts in the yarn. That made me a little pissy to start with… then whilst knitting on and on forever, I came to several spots where the yarn was just frayed, barely hanging on my one little strand of nylon. I had to tink back a few stitches cut and rejoin a new piece. Having to do this once, ok… but again and again… this yarn is total crap! However, I was already so invested in soooo many hours of monogamous knitting (yes you heard me right), I had to keep going. This morning I was up early so I gave it a good steam press and that worked out some of the curl and I was able to wear to work today. I can definitely wrap this around 3 times if I want to keep my neck warm, but it’s long enough to wear as decoration, so that is probably what I’ll do! 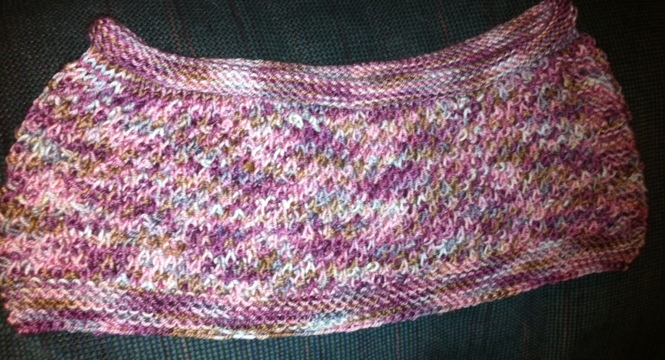 Anyway, happy to be done, now I can go back to my gorgeous Kniterati Mystery Shawl/Scarf and finish it up this weekend. YAY! Progress!